LATIN: Scabiosa columbaria subsp columbaria L.
Scabiosa columbaria subsp columbaria L.
Flora Gallica 2014 as Scabiosa columbariaScabiosa columbaria subsp. columbaria L.
A sparsely hairy perennial with a little-branched, glabrous stem 15-60 cm high, growing from a long tap-root. Ecology UK: It is common in dry, calcareous grassland northwards to mid-Scotland. Flowers: [Involucre contain outer row of about 10 folioles (bracts) + inner row of smaller folioles (not obviously an inner row). Black hairs clearly visible. 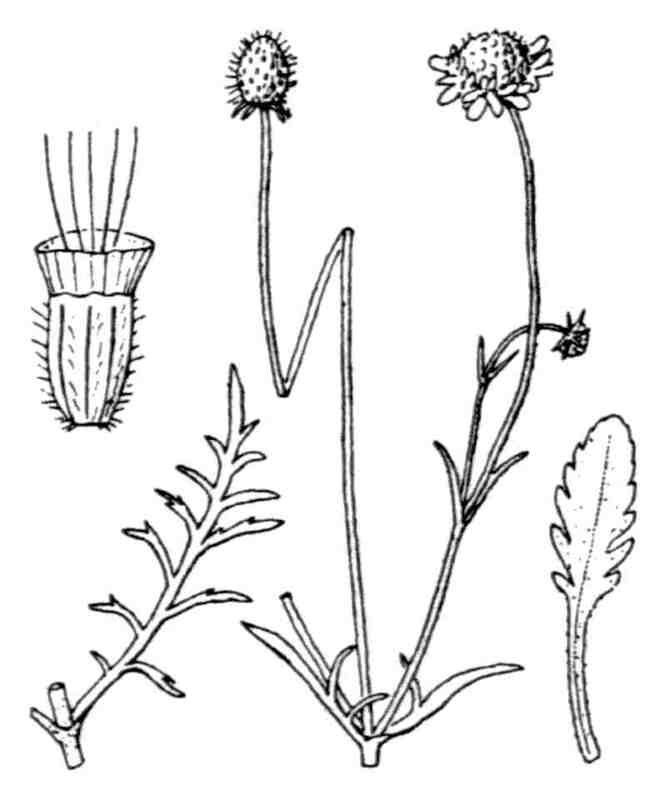 5-6 sepals (c.f Knautia)]. Outer flowers 6-7 mm diam., with 3 enlarged petals; inner 3 mm diam., regular, arranged in a flattish head 30-35 mm diam. ; bracts linear, shorter than flowers; calyx with 5 long, setaceous points; corolla pale blue or white. Leaves: all pinnate; lobes of lowest, lanceolate, toothed; of others linear. Fruit : arêtes calicinales noirâtres, sétacées dès la base et sans nervure, 3-4 fois plus longues que la couronne. Fruit: Fruiting head ovate, the achenes ribbed and hairy and crowned by the involucral cup and the calyx bristles.